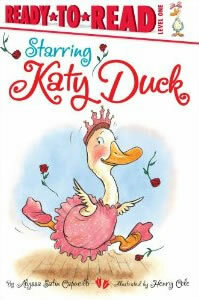 Everyone’s favorite dancing duck is back in this Katy Duck adventure about conquering your fears. Everyone knows Katy Duck loves to dance. When Mr. Tutu tells Katy and her dance class about an upcoming recital, Katy can hardly wait! At last it’s time to perform, but onstage Katy suffers from a case of stage fright! Will Katy conquer her shyness and learn to dance in the spotlight?